Take a look at this three bedroom, two bathroom beach side condo that sleeps 8 guests, room 119. The enormous kitchen offers a plethora of counter space and all the full size appliances, pots, pans, dishware, and silverware needed to prepare your favorite meal. The condo has an abundance of seating. The main Dining Area is adjacent to the kitchen and comes with a large rectangular table set for six, while the kitchen bar seating seats two. The Living Room comes with a plush chair with ottoman, a wraparound couch, a flat screen wall mounted HDTV, a DVD player, and balcony access. The first Guest Bedroom has two Twin beds and a wall mounted flat screen HDTV. The second Guest Bedroom has a Queen bed as well as a wall mounted HDTV. The shared Guest Bathroom has a bathtub/shower combination. The Master Bedroom has a King Bed, a big screen wall mounted HDTV, and balcony access. The Master Bathroom has a separated makeup area with its own vanity, an additional vanity, and a walk in shower. The balcony is hexagonal in shape and has its own wet bar. It also has an outside dining table and views of Inlet Reef’s pool area and the Gulf of Mexico’s emerald green waters. Other amenities include complimentary high speed wireless internet access and a full size washer and dryer. 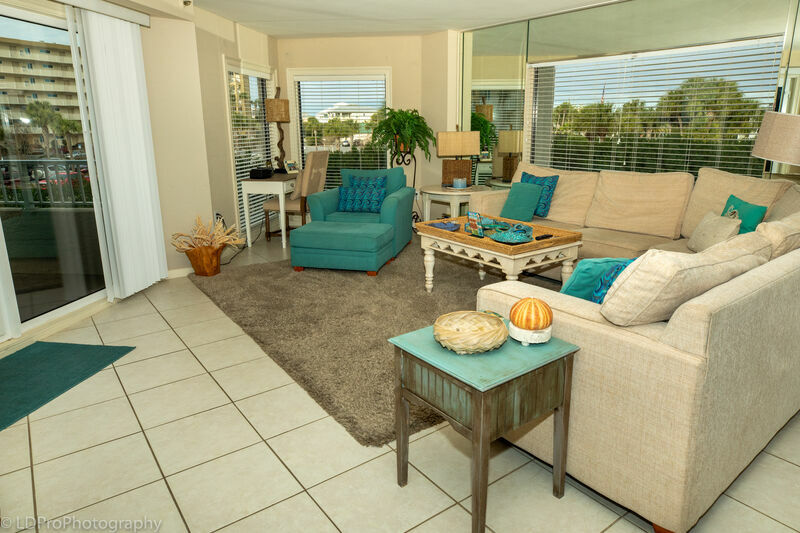 Do not delay in booking this wonderful three bedroom beachside condo- it will not last long! Complex amenities include men & women's saunas, pool (seasonally heated), exercise room, & tennis courts. What a great location. Easy access to the beach made the stay very enjoyable. The unit was nice and clean. It had everything we needed to stay for a week and be comfortable. Any requests we made were attended to very quickly. What started out as a not so good time was quick taken care of. Holiday Isle went above and beyond our expiations. The cond was beautiful and right on the beach. They made this vacation/graduation trip one we will never forget. Staff was very friendly. Definitely will book with yall next year! Sew yall in June 2018. We love Destin and particularly the Holiday Isle area. This condo was very nice and located right on the beach. We loved it! If you find lower rates on a website other than inletreefclub.com please call us at (800) 837-5102 and our vacation specialists will verify the price difference with you and that the specific home is available. Our team will meet or beat the price to ensure that you can always confidently book directly with us. Copyright © 2019 Inlet Reef Club. All Rights Reserved.